After finishing Secret of South Lodge‘s first game, we headed back to their waiting area for a few minutes’ rest. If you get the chance, I highly recommend taking a look at the African artefacts dotted around the space, which felt to me almost museum-like in its layout. If you’re lucky enough to get Bob hosting your game, then you should definitely ask him to tell you about the exhibits, as he really knows his stuff. The good news is that they’re planning on adding extra information to the artefacts so, even if he’s not around, you can still find out some of the background. Museum tour over, it was time for our last game of 2017 (and my 396th of the year…). The secrets of South Lodge may be valuable beyond measure, but dangers await those who would learn them. Knowing the risks, Sir Henry built a back-up laboratory in South Lodge. Having played their other game, I had a very clear picture of what this one would be like, but it turned out I was utterly, utterly wrong. This time round, we were in a laboratory with a cluttered, industrial feel. 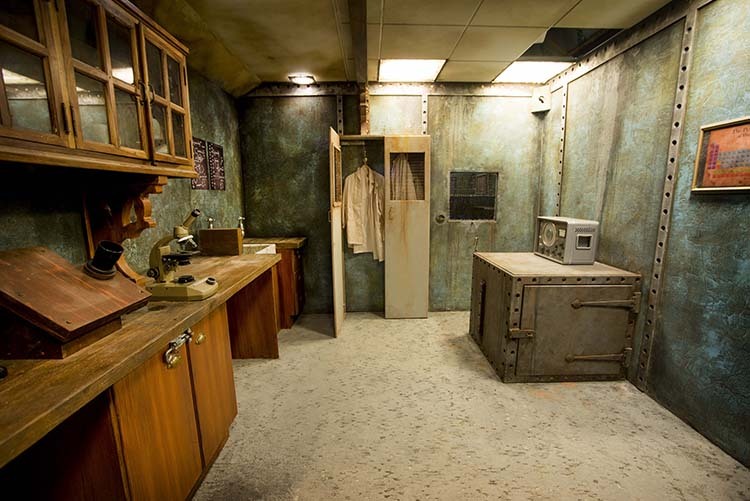 Not in a bad way – this felt like a place where serious engineering might have taken place, and they’d repurposed old chunky lab appliances to create the right vibe for the game. Those pieces of technology made the interactions feel satisfying: they weren’t just RFID chips embedded inside props that had to be put in a certain place but big, chunky pieces of equipment that clicked into position. This game almost overwhelmed us with puzzles on entering the room, and they were pretty much all on theme. There was one major exception which they’d clearly added because it was a fun two-player challenge, but I’ll forgive them that because it really was a fun experience. I was particularly impressed by how thematic some of the solutions were, where we had to interact with the equipment in the laboratory rather that just inputting a solution on a lock. One mechanic for inputting codes that seemed a little ugly and brute-forceable, but the “locks” were generally pretty clean and didn’t get in the way of the experience. As I said above, the sheer volume of things to investigate on entering the room was almost intimidating but, once we started moving, we quickly fell into a rhythm and soon had an idea of which parts of the room were puzzles and which were just decoration. That openness dried up suddenly just after the halfway mark in a way that really affected our experience. Three of the last few puzzles were almost impossible to get more than two people physically involved with, so some players ended up being sidelined for a fair chunk of the endgame. Puzzles that sideline players when nothing else is on offer are never a great idea, but to have several of them close together, particularly as you’re about to escape the room, was particularly unfortunate. The finale to this game was right up there with the best – with you carrying out a couple of reasonably straightforward steps to complete your mission. It felt like a perfectly fitting ending. Clues came over a screen (either offered or asked for, as preferred by the players). We escaped in a shade over 40 minutes having used two. Of the 20 games we played in the region, this was my favourite. Good puzzles, fun theatre, plenty to get stuck into and a pretty set. Just the way you want to see out the old escape year. This is a tough room that I’d happily recommend for four or five people – even if they’re enthusiasts. You may find yourself a little blocked towards the end but, overall, I still think you’ll have a great experience.